Weddings can pose logistical problems for any couple, but Chelsea Clinton and Marc Mezvinsky had the added challenge of keeping the details of their July 31 wedding under wraps despite ravenous media interest. Though the bride's father had been out of the Oval Office for nearly a decade, Chelsea, like many presidential children before her, was faced with reconciling matrimonial privacy and publicity, intimacy and grandeur. 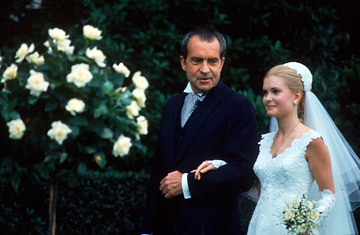 First Family weddings have typically been major social events, especially those rare ones that have taken place in the White House. Nine presidential kids have gotten hitched there, starting with Maria Monroe in 1820. Nellie Grant's 1874 nuptials were much hurrahed: after all, Walt Whitman may have celebrated all Americans, but he didn't write poems for just any bride. Nellie's day was trumped, however, by Alice Roosevelt's spectacular 1906 wedding, at which at least one guest fainted and Teddy's famously boisterous daughter cut her cake with a sword. Luci Baines Johnson's 1966 wedding sparked intense network coverage, and comedian Edie Adams quipped that only "the immediate country" had been invited. But for all the presidential kids who've reveled in America's version of a royal wedding, there are also those who've shunned the strictures of Washington. Jenna Bush headed down to the family ranch in Crawford, Texas, for her ceremony, perhaps inspired by her aunt Dorothy (daughter of George H.W. Bush), who tied the knot at Camp David in 1992. JFK Jr. managed to have a secretive wedding with Carolyn Bessette on Georgia's Cumberland Island in 1996, and that same year, Amy Carter was married outside Plains, Ga., with less pomp and circumstance than most. The 39th President was present, but Jimmy didn't give his daughter away. Amy said she "didn't belong to anyone." Least of all, the public.